In C++ and Java, there are two ways to call a function or a method. 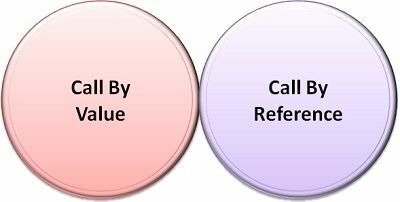 The first is “call by value” and the second is “call by reference”. Call by value method passes only the value of a variable to the function code, and if there is any change in the value of a variable inside that function it does not affect the original value of that variable. In call by reference method, we pass the variable itself in an argument, and the change in the value of a variable also affects the original value of that variable. The main difference between both the methods is, call by value method passes the value of a variable and call by reference passes the address of that variable. A copy of the variable is passed. A variable itself is passed. Effect Change in a copy of variable doesn't modify the original value of variable out side the function. Change in the variable affect the value of variable outside the function also. Default calling primitive type are passed using "call by value". objects are implicitly passed using "call by reference". If you pass a primitive data type (integer, character, and string ) to a function/method, then only it’s “value” is passed to the function code. The function copies that value of an argument to a ‘formal parameter’ of the function code. If there is any modification to the formal parameter in a function code, it will not modify of the original value of the argument which is used to call that function. In simple words, if a function/method is called by ‘call by value’ approach; then a copy of the variable is passed to the function code. If a function code makes any changes to the value in the copy of the variable, it doesn’t change the original value of the variable. Let’s see an example to understand this briefly. Call by Reference method passes a reference/address of an argument to the function code. As the address of an argument is passed to the function code, the formal parameter accepting that address would be a ‘pointer’ variable. Now, as function code has obtained the address of an argument, the modification in the value of an argument will also modify the original value of an argument. In C++ and Java, it is very common to pass the object to the function/method and object are always passed by its reference. Changes done to the object inside the function/method affects the object used to invoke that function/method. Following fragment shows the correct way to ‘call by reference’. swap S(&a, &b); //call by reference. Now let’s discuss ‘call by reference’ by passing an ‘object’ as an argument, which is implicitly passed by the approach ‘call by reference’. check C=new check(20,40); //object initialization. Passing the argument by using ‘call by value’ approach only passes the copy of that variable, so changes made to the value in the copy of that variable does not affect the original value of that variable. In ‘call by reference’ approach the variable itself is passed as an argument, so changes to it modifies the value of the original variable. If the arguments passed are primitive datatypes they are simply ‘call by value’, but if the references/addresses of the arguments or objects are passed then a function is called by ‘call by reference’ method. In ‘call by value approach’ the arguments passed are only the name of variables whereas, in ‘call by reference’ approach the arguments passed are, variable name along ‘&’ sign, or an object which is passed just by its name. Receiving parameters of the argument in ‘call by value’ approach are variable name along with its data type. In ‘call by reference’ approach the receiving parameter is always a pointer variable along with the data type and in the case of object it is an object name along with its class type. C++ and Java use both the approaches depending on what is passed. If you want to pass only the value of variable use’call by value’ approach and if you want to see the change in the original value of the variable then use ‘call by reference’ approach. I read few comparisons and wow they are amazingly explained. Nice work.